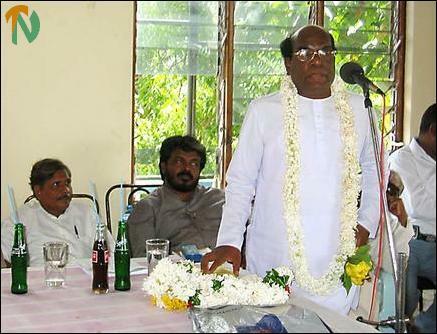 Mr. Vinayagamoorthy denied accusations that his party was sowing discord in the Tamil National Alliance. He claimed that the ACTC was the first party to insist that the Liberation Tigers should be accepted by all as the sole representatives of the Tamils people. “How can we trust President Chandrika Kumaratunga when she so brazenly hurt the feelings of the Tamil people by holding her party rally and processions on Deepavali?” the ACTC leader asked. He claimed that his party was firm in its decision that the TNA should support Prime Minister Ranil Wickremesinghe during the crisis precipitated by President Kumaratunga when she sacked three United National Front Ministers. On a note of caution Mr. Vinayagamoorthy said: “We are holding such meetings only to strengthen the hands of the Liberation Tigers and not to promote our party”. Mr. Nallaiah Kumarakuruparan, the general secretary of the ACTC also addressed the small gathering at Lake View Inn in Batticaloa town.